Okieladybug's Scrap N' More: Have you seen the new Expressions? Thanks to Tammy Skinner, aka CREATIVE CRITTERS, posting a pic on facebook we now have a little bite off the new scoop of flavor about the new Cricut machine! She said there will be more details to come so be sure to check her site for updates. She also has some great pictures on her site right now of CHA. Knowing Tammy she will try to keep us updated. I am sure most of you are familiar with Tammy, but if you are not, she is a fantastic person and crafter and she will also be one of my ship mates on the Cricut Cruise in less than a month *okie lets out a little scream of excitement*. Notice there are no buttons on this sucker! It must be a touch screen like the Imagine *okie is still not wanting an Imagine*. ~It has WIFI! No more having a cord from your computer to your machine if you are a Design Studio user!! ~It can remember your settings for different materails you cut. For instance if you want to save settings for vinyl, cardstock, thin paper etc. you will be ale to save it in the machine so next time you will have the settings ready. The blade depth is still manual. I have done some crafting this past week but it has been slow going. Not sure why...but it has! I will have some projects to post for next week. I will be participating in a blog hop soon *okie can't remember the date right off* and will let you know for sure when it will be. I will have blog candy up for grabs from me personally but there will also be some great prizes you can have a chance to win along the way and for finishing the hop. Right now I am heading out the door. My favorite bargain store is having a half off blue tag sale and I want to go see if they have any clothing that would be good to take on the cruise! I saw this HUGE stuffed lady bug at Wal Mart last night and I thought of you. 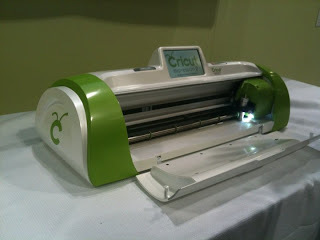 As for the Cricut 2...not feeling it anymore than I am feeling the Imagine. My current machine does everything I want and need it too and though the wi-fi and digital settings would be nice, it's not a requirement for me. Honestly, I'm kind of disappointed because PC keeps developing machines instead of bring us the cartridges we've been asking for for years...that makes no sense to me. If I ever buy another cutting machine, I am positive it will not be a Provo Craft one. WIFI it's for the computer!!!! There MUST BE A NEW DS coming out too.....Can't wait for MORE DETAILS!! I don't want the Imagine either. goodness! what else are they gonna come out iwth? can they let us enjoy what we already have before tehy come out with something new? that being said - HOW COOL! like it but PC doesn't like Mac computers. So i will be out of luck again. I have DS but have not been able to use it for 3 yrs now cause i have a mac. I also do not like the imagine. I know i will not use it, but i do like this one. Seems like a cool thing. It only cuts. fun. I am with you Okie, I will stick with my E I love it, now I might got up to the new one because, I love wireless. OMG ... Now you've gone and done it Girlfriend ... you've peaked my interest and I NEED TO KNOW MORE!!! I'm curious why we would use the Imagine carts on this if it doesn't also print ... but then maybe we are talking about the Imagine image carts and not the pattern carts??? Either way, I'm anxious to hear more about this and how it interacts with both a Gypsy and Design Studio. If this little puppy is cordless, then it's a winner in my book. I also like that it is not a big and bulky as the Imagine. Hmmm ... I noticed a different logo on this Cricut ... looks like more of a "Circle" thingy. What's up with that? Wireless sounds awesome! Bug Hugs! Thanks for the shout out girl!! I now have videos showing the Craft Room on my blog. It is MAC compatible and FREE! I can't wait until the Cricut Cruise!!! Gonna be so much fun!